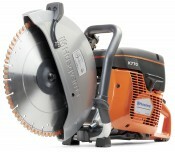 This new tool is available now from SM Plant Limited, along with other new Husqvarna plant. New Husqvarna Tool Electric power cutter - wet £ Price on application The K3000 offers wet and dry cutting in one machine - electric all-round wet cutter that minimises the amount of water and slurry. New Husqvarna Tool Electric power cutter £ Price on application Husqvarna K6500 is equipped with high frequency PRIME™ technology, making it their most powerful electric cutter ever. New Husqvarna Tool Petrol power cutter - cut-n-break £ Price on application The cut-n-break method is the natural choice when you need to cut deep at low maintenance costs. The K 760 cut-n-break enables you to cut as deep as 400 mm from one side.